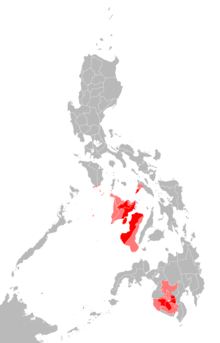 The Hiligaynon language, also often referred to by most of its speakers simply as Ilonggo, is an Austronesian regional language spoken in the Philippines by about 9.1 million people, mainly in Western Visayas and Soccsksargen, most of whom belong to the Visayan ethnic group, mainly the Hiligaynons. It is the second-most widely spoken language and a member of the so-named Visayan language family and is more distantly related to other Philippine languages. Hiligaynon is mainly concentrated in the regions of Western Visayas (Iloilo, Capiz, Guimaras, and Negros Occidental), as well as in South Cotabato, Sultan Kudarat, and North Cotabato in SOCCSKSARGEN. It is also spoken in other neighboring provinces, such as Antique and Aklan (also in Western Visayas), Negros Oriental in Central Visayas, Masbate in Bicol Region, Romblon and Palawan in MIMAROPA. It is also spoken as a second language by Kinaray-a speakers in Antique, Aklanon/Malaynon speakers in Aklan, Capiznon speakers in Capiz and Cebuano speakers in Negros Oriental. There are approximately 9,300,000 people in and out of the Philippines who are native speakers of Hiligaynon and an additional 5,000,000 capable of speaking it with a substantial degree of proficiency. The language is also often referred to as Ilonggo (Spanish: Ilongo) in Iloilo and Negros Occidental. Many speakers outside Iloilo argue, however, that this is an incorrect usage of the word "Ilonggo". In precise usage, "Ilonggo" should be used only in relation to the ethnolinguistic group of native inhabitants of Iloilo and the culture associated with native Hiligaynon speakers in the place including their dialect. The disagreement over the usage of "Ilonggo" to refer to the language extends to Philippine language specialists and native laypeople. It also has the one of the largest native language-speaking population of the Philippines despite not being taught and studied formally in schools and universities until 2012. Hiligaynon is given the ISO 639-2 three-letter code hil, but has no ISO 639-1 two-letter code. Historical evidence from observations of early Spanish explorers in the Archipelago shows that the nomenclature used to refer to this language had its origin among the people of the coasts or people of the Ilawod ("los [naturales] de la playa"), whom Loarca called Yligueynes  (or the more popular term Hiligaynon, also referred to by the Karay-a people as "Siná"). In contrast, the "Kinaray-a" has been used by what the Spanish colonizers called Arayas, which may be a Spanish misconception of the Hiligaynon words Iraya or taga-Iraya, or the current and more popular version Karay-a (highlanders - people of Iraya/highlands). 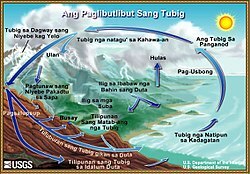 The Water cycle diagram in Hiligaynon. Similar to many languages in the Philippines, very little research on dialectology has been done on Hiligaynon. Some of the widely recognized varieties of the language are Standard or Urban Hiligaynon (Iloilo provincial and Iloilo City variant), simply called "Ilonggo", Bacolodnon Hiligaynon (Metro Bacolod variant), Negrense Hiligaynon (provincial Negros Occidental variant which is composed of 3 sub-variants: Northern, Central and Southern Negrense Hiligaynon), Guimaras Hiligaynon, and Mindanao Hiligaynon. Some native speakers also consider Kinaray-a (also known as Hiniraya or Antiqueño) and Capiznon as dialects of Hiligaynon; however, these have been classified by linguists as separate (Western) Visayan languages. According to H. Otley Beyer and other anthropologists, the term Visayan was first applied only to the people of Panay and to their settlements eastward in the island of Negros (especially its western portion), and northward in the smaller islands, which now compose the province of Romblon. In fact, at the early part of Spanish colonialization of the Philippines, the Spaniards used the term Visayan only for these areas. While the people of Cebu, Bohol and Leyte were for a long time known only as Pintados. The name Visayan was later extended to these other islands because, as several of the early writers state, their languages are closely allied to the Visayan dialect of Panay. Hiligaynon is written using the Latin script. Until the second half of the 20th century, Hiligaynon was widely written largely following Spanish orthographic conventions. Nowadays there is no officially recognized standard orthography for the language and different writers may follow different conventions. It is common for the newer generation, however, to write the language based on the current orthographic rules of Filipino which is more or less phonemic. A noticeable feature of the Spanish-influenced orthography absent in those writing following Filpino's orthography is the use of "c" and "qu" in representing /k/ (now replaced with "k" in all instances) and the absence of the letter "w" (formerly used "u" in certain instances). The core alphabet consists of 20 letters used for expressing consonants and vowels in Hiligaynon, each of which comes in an upper case and lower case variety. The apostrophe ⟨'⟩ and hyphen ⟨-⟩ also appear in Hiligaynon writing, and might be considered separate letters. The hyphen, in particular, is used medially to indicate the glottal stop san-o ‘when’ gab-e ‘evening; night’. It is also used to in reduplicated words: adlaw-adlaw ‘daily, every day’, from adlaw ‘day, sun’. This marking is not used in reduplicated words whose base is not also used independently, as in pispis ‘bird’. Hyphens are also used in words with successive sounds of /g/ and /ŋ/, to separate the letters with the digraph NG. Like in the word gin-gaan 'was given'; without the hyphen, it would be read as gingaan /gi.ŋaʔan/ as opposed to /gin.gaʔan/. In addition, some English letters may be used in borrowed words. Hiligaynon has three types of case markers: absolutive, ergative, and oblique. These types in turn are divided into personal, that have to do with names of people, and impersonal, that deal with everything else, and further into singular and plural types, though the plural impersonal case markers are just the singular impersonal case markers + mga (a contracted spelling for /maŋa/), a particle used to denote plurality in Hiligaynon. The case markers do not determine which noun is the subject and which is the object; rather, the affix of the verb determines this, though the ang-marked noun is always the topic. Ang lalaki nagkaon sang tinapay. ≈ Ang tinapay ginkaon sang lalaki. In addition to this, there are two verbal deictics, karí, meaning come to speaker, and kadto, meaning to go yonder. Hiligaynon lacks the marker of sentence inversion "ay" of Tagalog/Filipino or "hay" of Akeanon. Instead sentences in SV form (Filipino: Di karaniwang anyo) are written without any marker or copula. "Si Maria matahum/ Si Maria guapa" (Hiligaynon) = "Maria is beautiful." There is no direct translation for the English copula "to be" in Hiligaynon. However, the prefixes mangin- and nangin- may be used to mean will be and became, respectively. "It is nice to become rich." The Spanish copula "estar" (to be) has also become a part of the Hiligaynon lexicon. Its meaning and pronunciation have changed compared to its Spanish meaning, however. In Hiligaynon it is pronounced as "istar" and means "to live (in)/location"(Compare with the Hiligaynon word "puyô"). "I live in tabuc suba" "tabuc suba" translates to "other side of the river" and is also a barangay in Jaro, Iloilo. To indicate the existence of an object, the word may is used. When an adjective modifies a noun, the linker nga links the two. Sometimes, if the linker is preceded by a word that ends in a vowel, glottal stop or the letter N, it becomes acceptable to contract it into -ng, as in Filipino. This is often used to make the words sound more poetic or to reduce the number of syllables. Sometimes the meaning may change as in maayo nga aga and maayong aga. The first meaning: (the) good morning; while the other is the greeting for 'good morning'. The linker ka is used if a number modifies a noun. A derivation of diin, tagadiin, is used to inquire the birthplace or hometown of the listener. Kamusta means how, as in "How are you?" A derivative of ano, paano, means how, as in "How do I do that?" "How can I get home?" "How many are with you?" A derivative of pila, ikapila, asks the numerical order of the person, as in, "What place were you born in your family? "(first-born, second-born, etc.) This word is notoriously difficult to translate into English, as English has no equivalent. "What place were you born into your family?" A derivative of pila, tagpila, asks the monetary value of something, as in, "How much is this beef?" Tagpila ini nga karne sang baka? "How much is this beef?" The man is stealing rice from the market for his sister. The man stole the rice. vs. The rice was stolen by the man. Nagakawat ang lalaki sang bugas sa tinda para sa iya utod. Ginakawat sang lalaki ang bugas sa tinda para sa iya utod. Ginakawatan sang lalaki sang bugas ang tinda para sa iya utod. Ginakawatan sang lalaki sang bugas sa tinda para sa iya utod. Hiligaynon, like other Philippine languages, employs reduplication, the repetition of a root or stem of a word or part of a word for grammatical or semantic purposes. Reduplication in Hiligaynon tends to be limited to roots instead of affixes, as the only inflectional or derivational morpheme that seems to reduplicate is -pa-. Root reduplication suggests 'non-perfectiveness' or 'non-telicity'. Used with nouns, reduplication of roots indicate particulars which are not fully actualized members of their class. Note the following examples. Reduplication of verbal roots suggests a process lacking a focus or decisive goal. The following examples describe events which have no apparent end, in the sense of lacking purpose or completion. A lack of seriousness may also be implied. Similarly, reduplication can suggest a background process in the midst of a foreground activity, as shown in (5). (3) Nag-a- hìbî-híbî ang bátâ. The child has been crying and crying. I'm just cleaning off the table (casually). (5) Nag-a- kàon-káon gid silá sang nag-abót ang íla bisíta. They were just eating when their visitor arrived. When used with adjectival roots, non-telicity may suggest a gradualness of the quality, such as the comparison in (6). In comparative constructions the final syllables of each occurrence of the reduplicated root are accented. If the stress of the second occurrence is shifted to the first syllable, then the reduplicated root suggests a superlative degree, as in (7). Note that superlatives can also be created through prefixation of pinaka- to the root, as in pinaka-dakô. While non-telicity can suggest augmentation, as shown in (7), it can also indicate diminishment as in shown in (9), in contrast with (8) (note the stress contrast). In (8b), maàyoáyo, accented in the superlative pattern, suggests a trajectory of improvement that has not been fully achieved. In (9b), maàyoayó suggests a trajectory of decline when accented in the comparative pattern. The reduplicated áyo implies sub-optimal situations in both cases; full goodness/wellness is not achieved. This room is darker than that one. (8) (a) Ma-áyo ang reló. (b) Ma-àyo-áyo na ang reló. Consonants [d] and [ɾ] were once allophones but cannot interchange as in other Philippine languages: patawaron (to forgive) [from patawad, forgiveness] but not patawadon, and tagadiín (from where) [from diín, where] but not tagariín. There are three main vowels: /a/, /ɛ ~ i/, and /o ~ ʊ/. [i] and [ɛ] (both spelled i) are allophones, with [i] in the beginning and middle and sometimes final syllables and [ɛ] in final syllables. The vowels [ʊ] and [o] are also allophones, with [ʊ] always being used when it is the beginning of a syllable, and [o] always used when it ends a syllable. Hiligaynon has a large number of words that derive from Spanish words including nouns (e.g., santo from santo, saint), adjectives (e.g., berde from verde, green), prepositions (e.g., antes from antes, before), and conjunctions (e.g., pero from pero, but). Moreover, Spanish provides the Hiligaynon base for items introduced by Spain, e.g., barko (barco, ship), sapatos (zapatos, shoes), kutsilyo (cuchillo, knife), kutsara (cuchara, spoon), tenedor (fork), plato (plate), kamiseta (camiseta, shirt), and kambiyo (cambio, change, as in money). Spanish verbs used in Hiligaynon often remain unconjugated (have the verb endings -ar, -er or -ir) which in Filipino would almost always be conjugated in the 'vos' form, e.g., komparar, mandar, pasar, tener, disponer, mantener, and asistir. The names of the days of the week are derived from their Spanish equivalents. Thank you very much! Salamat gid./ Madamò gid nga salamat! I'm sorry. Patawaron mo ako. / Pasayloha 'ko. / Pasensyahon mo ako. / Pasensya na. Help me! Buligi (a)ko! / Tabangi (a)ko! Take care(Also used to signify Goodbye) Halong. Are you angry/scared? Akig/hadlok ka? Do you feel happy/sad? Nalipay/Nasubo-an ka? I don't care Wa-ay ko labot! That's wonderful/marvelous! Námì-námì ba! / Nami ah! I like this/that! Nanámìan ko sini/sina! I love you. Palangga ta ka./Ginahigugma ko ikaw. I am fine, how about you? Maayo man, ikaw ya? How old are you? Pila na ang edad (ni)mo? / Ano ang edad mo? / Pila ka tuig ka na? I am 24 years old. Beinte kwatro anyos na (a)ko./ Duha ka pulo kag apat ka tuig na (a)ko. I am Erman. Ako si Erman./Si Erman ako. What is your name? Ano imo ngalan?/ Ano ngalan (ni)mo? Until next time. Asta sa liwat. What is this/that? Ano (i)ni/(i)nâ? This is a sheet of paper. Isa ni ka panid sang papel./Isa ka panid ka papel ini. That is a book. Libro (i)nâ. What will you do?/What are you going to do? Ano ang himu-on (ni)mo? / Ano ang buhaton (ni)mo? / Maano ka? What are you doing? Ano ang ginahimo (ni)mo? / Gaano ka? Where are you now? Diin ka (na) subong? Where shall we go? Diin (ki)ta makadto? Where are we going? Diin (ki)ta pakadto? Where are you going? (Sa) diin ka makadto? We shall go to Iloilo. Makadto (ki)ta sa Iloilo. We're going to Bacolod. Makadto kami sa Bacolod. I am going home. Mapa-uli na ko (sa balay). / (Ma)puli na ko. Where do you live? Diin ka naga-istar?/Diin ka naga-puyô? Where did you come from? (Where have you just been?) Diin ka (nag)-halin? Have you been here long? Dugay ka na di(ri)? (To the) left. (Sa) wala. (To the) right. (Sa) tuo. What time is it? Ano('ng) takna na?/Ano('ng) oras na? It's ten o'clock. Alas diyes na. What time is it now? Ano ang oras subong?/Ano oras na? May/Can I buy? Pwede ko ma(g)-bakal? How much is this/that? Tag-pilá iní/inâ? Is this expensive? Mahal ba (i)ni? Is that cheap? Barato ba (i)na? The Catholic version of the Ten Commandments in Hiligaynon at Molo Church, Molo, Iloilo City. Antonio Ledesma Jayme (1854–1937) Lawyer, revolutionary, provincial governor and assemblyman. Born in Jaro, lived in Bacolod City. Graciano López Jaena (1856–1896) Journalist, orator, and revolutionary from Iloilo, well known for his written works, La Solidaridad and Fray Botod. Born in Jaro. Flavio Zaragoza y Cano (1892–1994) Lawyer, journalist and the "Prince of Visayan poets". Born in Janipaan..
Magdalena Jalandoni (1891–1978) Prolific writer, novelist and feminist. Born in Jaro. Angel Magahum Sr. (1876–1931) Writer, editor and composer. Composed the classic Iloilo ang Banwa Ko, the unofficial song of Iloilo. Born in Molo. Elizabeth Batiduan Navarro Hiligaynon drama writer for radio programs of Bombo Radyo Philippines. ^ Hammarström, Harald; Forkel, Robert; Haspelmath, Martin, eds. (2017). "Hiligaynon". Glottolog 3.0. Jena, Germany: Max Planck Institute for the Science of Human History. ^ "Islas de los Pintados: The Visayan Islands". Ateneo de Manila University. Archived from the original on September 27, 2011. Retrieved March 29, 2013. ^ Ulrich Ammon; Norbert Dittmar; Klaus J. Mattheier (2006). Sociolinguistics: an international handbook of the science of language and society. Volume 3. Walter de Gruyter. p. 2018. ISBN 978-3-11-018418-1. ^ Cf. BLAIR, Emma Helen & ROBERTSON, James Alexander, eds. (1903). The Philippine Islands, 1493–1803. Volume 05 of 55 (1582–1583). Historical introduction and additional notes by Edward Gaylord BOURNE. Cleveland, Ohio: Arthur H. Clark Company. ISBN 978-0554259598. OCLC 769945704. "Explorations by early navigators, descriptions of the islands and their peoples, their history and records of the Catholic missions, as related in contemporaneous books and manuscripts, showing the political, economic, commercial and religious conditions of those islands from their earliest relations with European nations to the beginning of the nineteenth century. ", pp. 120-121. ^ Cf. Miguel de Loarca, Relacion de las Yslas Filipinas (Arevalo, June 1582) in BLAIR, Emma Helen & ROBERTSON, James Alexander, eds. (1903). The Philippine Islands, 1493–1803. Volume 05 of 55 (1582–1583). Historical introduction and additional notes by Edward Gaylord BOURNE. Cleveland, Ohio: Arthur H. Clark Company. ISBN 978-0554259598. OCLC 769945704. "Explorations by early navigators, descriptions of the islands and their peoples, their history and records of the catholic missions, as related in contemporaneous books and manuscripts, showing the political, economic, commercial and religious conditions of those islands from their earliest relations with European nations to the beginning of the nineteenth century. ", pp. 128 and 130. ^ "Capiznon". ethnologue.com. Archived from the original on 2013-02-03. ^ "Kinaray-a". ethnologue.com. Archived from the original on 2013-02-03. ^ G. Nye Steiger, H. Otley Beyer, Conrado Benitez, A History of the Orient, Oxford: 1929, Ginn and Company, pp. 122-123. ^ Wolfenden, Elmer (1971). Hiligaynon Reference Grammar. Hawaii: University of Hawaii Press. pp. 61–67. ISBN 0-87022-867-6. ^ Motus, Cecile (1971). Hiligaynon Lessons. University of Hawaii Press. pp. 112–4. ISBN 0-87022-546-4. ^ Wolfenden, Elmer (1971). Hiligaynon Reference Grammar. University of Hawaii Press. pp. 136–7. ISBN 0-87022-867-6. English-Tagalog Ilongo Dictionary (2007) by Tomas Alvarez Abuyen, National Book Store. ISBN 971-08-6865-9. Wikivoyage has a travel guide for Hiligaynon phrasebook.